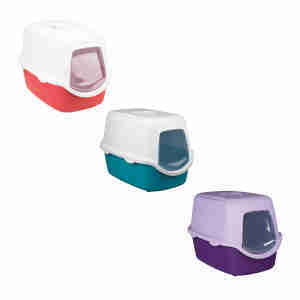 The Trixie Vico Litter Tray offers a private and hygienic spot for your cat to do their business. The hood of the tray keeps the space enclosed, whilst the double rim prevents the litter from being accidentally scattered out of the tray. As well as providing privacy for your cat, the hood hides the litter and keeps the tray out of sight. To clean the tray, remove the hood by releasing the click clasps. double rim reduces the chances of litter being scattered out of the tray.